Power disparities between populations are among the chief factors that determine who will have better access to resources and who will suffer from greater exposure to waste and hazardous materials. The State of Israel is a developed nation and a member of the Organisation for Economic Co-operation and Development (OECD). As such, its resource consumption per capita is high and it generates waste accordingly. Like other countries, Israel has a system in place for treating the waste generated in its territory. However, as this report reveals, a significant portion of this system is located outside Israel’s sovereign borders, in the West Bank. Abusing its status as an occupying power, Israel has set out less stringent regulations in industrial zones in settlements and even offers financial incentives such as tax breaks and government subsidies. This policy has made it more profitable to build and operate waste treatment facilities in the West Bank than inside Israel. B’Tselem research has found that there are at least fifteen Israeli waste treatment facilities in the West Bank. Most of the waste they process is produced in Israel. Six of the facilities handle hazardous waste which requires special processes and regulatory supervision due to the dangers it poses. This report focuses on five waste treatment facilities operating in the West Bank: four plants which process hazardous waste and dangerous substances produced in Israel – including infectious medical waste, used oils and solvents, metals, batteries and electronic industry byproducts – and one which processes sewage sludge. The findings presented in the report are based on the information available on the types of waste these facilities receive and the potential risks the plants’ operations pose. Israel regards the facilities built in the West Bank as part of its local waste management system, yet it applies less rigorous regulatory standards there than it does inside its own territory. Whereas polluting plants located within Israel are subject to progressive air pollution control legislation, polluting plants in the industrial zones of settlements are subject to virtually no restrictions. Moreover, the facilities in settlements are not required to report on the amount of waste they process, the hazards their operation pose, or the measures they adopt to prevent – or at least reduce – these risks. B’Tselem sent requests for information on these matters to the Ministry of Environmental Protection and the Civil Administration. The requests have gone unanswered. International standards in this field address the transfer of waste from the territory of one sovereign state to another. However, transferring waste into an occupied territory is a far graver issue, as residents of an occupied territory cannot oppose the decisions of the occupying power, and are entirely at its mercy. The Palestinian residents of the West Bank are a population under military rule. As such, they were never asked – to say nothing of having agreed – to take in hazardous waste. Prior informed consent is not even an option in their case. They have no influence over what types of plants operate in settlements’ industrial zones, or the legislation that determines what environmental rules apply there. They have no access to information about what goes on in these plants, whether any accidents have occurred, or what risks they pose to water sources, air quality and local residents’ health. Palestinians are not the only ones at risk from potential pollution. Unlike other Israeli practices in the West Bank that make a distinction between Palestinian residents and Israeli settlers, environmental hazards make no such distinction. That said, there is a difference. The settlers – whose presence in the West Bank is unlawful to begin with – are Israeli citizens. Therefore, they have access to, and influence over, decision-makers. Moreover, they can choose to live anywhere inside Israel, whereas the Palestinian residents have nowhere else to go. The West Bank is their home and they have no other. 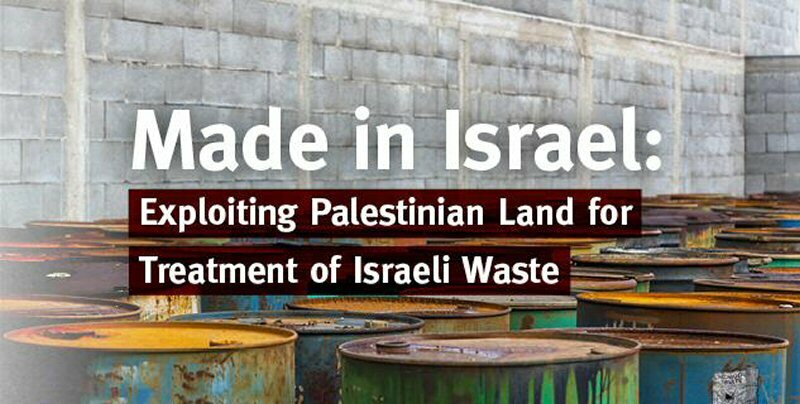 Waste treatment in the West Bank is simply one more facet of the exploitative policy Israel has practiced consistently for fifty years now, using Palestinian space and people to further its own interests. As part of this policy, Israel treats the West Bank – and particularly Area C, where it retained full control under the Oslo Accords – as an area meant to serve its needs exclusively, as if it were its sovereign territory. The international principles governing hazardous waste management are based on values of environmental justice, public consultation and transparency. An expression of basic human decency, they strive to codify the simple notion that military, political or economic power disparities should not be abused by the powerful in order to dump their pollution and waste in their disempowered neighbors’ backyards. When contrasted with these values, the reality Israel imposes on the West Bank in terms of waste management is unimaginably callous. Israel, taking into account its own needs alone, treats its waste in the West Bank and completely ignores its legal and moral obligations toward the Palestinian population there. Israel has turned the West Bank into a sacrifice zone, exploiting and harming the environment at the expense of the Palestinian residents, who are completely excluded from the decision-making process.